This past weekend was the San Diego Comic Con, or #SDCC. We were treated to a wealth of information about Theros, FTV:20, as well as the new Commander product, and that means there’s a lot to digest. What I find most exciting about these events is the opportunity to read between the lines. The information revealed is the first level, which everyone has access to. The utilization of this information to make educated guesses about the future is far less simple though, and rewards those who develop their critical thinking to derive actionable knowledge. We’ll begin with the most exciting item of the weekend financially: the black planeswalker promos. Hype around these exclusives was big going into the weekend, and presales on eBay were a solid $250. Then on Saturday afternoon, a post on MTGS reported that a mistake had occurred at the Wizards booth, and the entire inventory was already burned through. No more were available for the remainder of the con, and subsequently, there would be no copies available on the Hasbro toy shop website as originally announced. This news quickly made the rounds on Twitter, and the preorders on eBay jumped by $50 within hours. Within 48 hours, presales had climbed by a total of $200, reaching $450 and above. As I write this Monday afternoon, there is exactly one available for less than $500. The fact that they were supposedly going to be available online after the con had helped suppress their value, as people weren’t sure exactly how large the print run was, and many assumed they’d be able to pick up a set or two Monday morning. Running out on Saturday afternoon proved just how scarce these really were, which sent people into frenzy. One aspect of these that is really going to help push the price is that Wizards has absolutely no compulsion to print more. The cards are available in function in M14, so casual players and grinders alike have easy access to tournament-viable copies. That means these promos are purely collection-grade material, which is made even more obvious by their display-worthy packaging that is even more ostentatious than the Commander’s Arsenal box. The absolutely only thing that may help prevent them from reaching astronomical values is that not all the planeswalkers themselves are really that amazing from a gameplay standpoint, but in a highly limited printing like this, that will barely matter. $500 seems very plausible for these over the next few months, and many are anticipating $1,000 or more in the longer term. 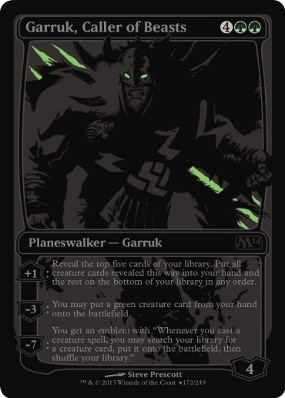 This is dependent on whether we see any other special printings like this in the future, but if we don’t see any foil black-on-black walkers again for some time, then $1,000 really isn’t impossible. One last word on these – I would guess it’s quite possible that upwards of 70% or even more will not be opened. They’ll be stashed in closets to appreciate in value. (That’s what I’m doing with mine.) Very, very few will be opened, and even fewer will appear in trade binders. Remember the comic book Jace? He’s currently $180, and there was no showy packaging to keep him sealed in. Value any SDCC walkers in the wild appropriately. The next largest finance news was the partial spoiling of From the Vault: Twenty. We mostly saw casual cards, with one gigantic exception: Jace, the Mind Sculptor, who catapulted FTV:20 preorders to over $450 each on eBay. 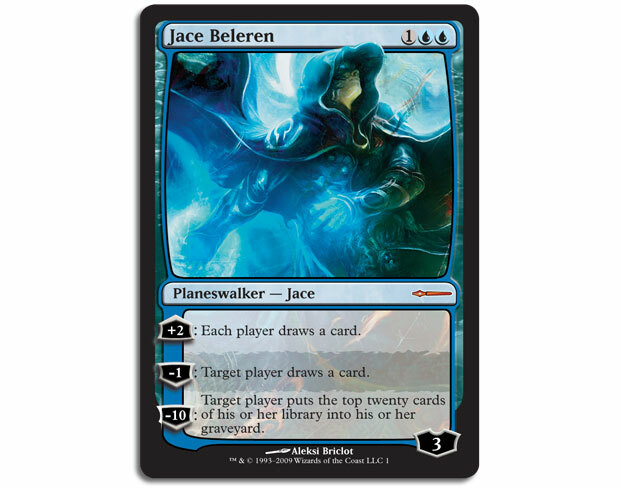 The news of Jace being reprinted was a huge shock to everybody that paid absolutely no attention to anything. For the last few months I’ve been telling anyone that will listen that his appearance as a promo in some fashion was imminent. Even though I’m to understand this announcement tanked his price on MTGO pretty hard, the good news for current owners of cardboard copies is that theirs will barely be affected, if at all. Every FTV release, people fear the original printing of the banner card will suffer greatly in price. There is not a single time this fear has come to bear. The FTV print run is simply too small to have any serious impact on the quantity of the card in question. If anything, the original card value will remain constant while the FTV copy just ends up being worth more. I don’t expect any drop in price of the WWK JTMS, foil or not. The only affect this will really have on the WWK JTMS price is that it makes it a bit tougher for him to see another drastic rise. How do we feel about this FTV at $450? Because we have precedent, the best way to gain insight is to compare directly to past FTV sets. Currently, the most expensive FTV on SCG is Exiled at $200. The rest of the FTV sets are retailing for $80-$180. While $200 is obviously a fair bit north of the $35 MSRP, it’s barely double the roughly $100-$125 market value it carried around the time of its release. Historically, it appears that sealed FTV sets maintain the market value reached at release, but are unlikely to even double that number years later. As respectable Bayesians, we need to understand there is only a small chance FTV 20 will deviate from this pattern. 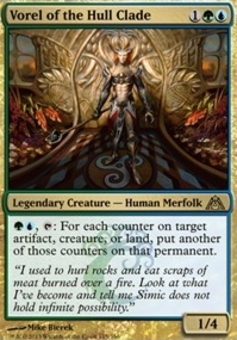 The single outstanding factor is that JTMS is bigger game than any other single FTV card in the past. Remember though, if Jace alone ends up selling for $250-300, $150-$200 is a pretty comfortable margin for the other 19 cards to occupy. “But Travis,” you exclaim, breath ragged, clutching your edge-worn My Little Pony playmat close to your threadbare videogame-t-shirt-adorned tumescent bulk, “foil Jace is $1,000! How could this not be over $800? Also do you have any bacon?” The answer is that FTV foils and pack foils are clearly different objects in the eyes of players. Because there are no non-foil FTV cards, their unconditional shiny nature is less remarkable. Pack foils are special though, as there is very clearly a ‘worse’ version of the card in existence. The easiest way to see this in practice this is to look up Urborg, Tomb of Yawgmoth. The FTV copy is around $15-$20. The pack foil is $50. Aside from the different (worse) foiling process of FTV, the cards are basically identical in all but price. The players have spoken, and the small set symbol that adorns the type line is apparently worth quite a bit of money. I don’t think you have much to lose at $400-$500 for the set, but I think the upside is relatively small given the cost to play ball. I would expect much greater returns on your money from other avenues. It’s worth mentioning that this is all dependent on Jace being the only big fish in this pond. Should Mana Drain or Force of Will appear, which while unlikely is certainly possible, then the numbers would change very quickly. Next on the docket is the announcement that a new batch of five Commander decks, with 15 brand-new cards between them, will be released in November of this year. The original five sold for MSRP longer than many unique MTG products often do, but ultimately they as well doubled in price. It’s possible that Wizards will issue a larger run this time than last, as these are designed to be a more casual and accessible product than Modern Masters and its ilk, but given their track record with every other sealed product that wasn’t a major set release, I doubt it. These seem ultra-safe at MSRP, with easy upside. Lastly, and most complexly, is the Theros information. I’m going to address this point-by-point. Theros will not be a multicolor set, but it will have a few multicolor cards. The first thing this says to me is that we will not be seeing filter lands this fall, which I had previously assigned a high probability. I also peg the possibility of Onslaught Fetchlands in Theros at 5% or less. (There are several reasons for this, but the simplest is that I don’t think Wizards wants fetches and shocks in standard. Once they both exist in the same format, a considerable amount of match time is spent just on making land drops, which is obnoxious from a tournament logistic standpoint.) The likely exclusion of Filters and Fetches from Theros leaves me wondering when we’ll see them next. Either the Filters or the Onslaught Fetches seem likely in the fall of 2014, but that means whichever is not has at least 2 years before we see it in any meaningful quantity. The immediate impact of all of this is that Filters are safer over the next few months than they were a week ago. They’ll probably see a solid rise around Modern season, especially ones that make red mana for Kiki-Jiki or blue for Cryptic Command. (Cascade Bluffs being the real winner.) Beyond that, the only thing that could really hamper their price in the next 12 months other than presence in the fall 2014 set is inclusion in a second modern product. I wouldn’t be surprised to see a second Modern Masters, but I’m not sure it will be as early as 2014. My position on them has changed from sell to soft hold/buy. The block is enchantment-matters. Upon hearing this, the first thing we need to do is scan gatherer for all cards that say “enchantment” or “aura.” My initial scan tells me that both Sundering Growth and Abrupt Decay especially rise in stock. Abrupt Decay functioning as removal for both creatures and enchantments has the potential to be very relevant. I didn’t see a lot else that jumped out at me yet, but I haven’t had a chance to do a full sweep of M14 and RTR to look for possible hidden synergies. It will be important to watch how enchantments in Theros function, as that has the opportunity to change how we value current enchantments-matter cards. Whenever I’m examining cards in light of this type of information, I try to keep Knight of the Reliquary in mind while browsing spoilers. It’s a perfect example of how a card can go from underwhelming to absurd overnight. The land cycle is one players have been asking for. I don’t know about you, but I have never heard someone talk about wanting the River of Tears cycle, or any of the future-shifted land cycle for that matter. None of them are bad per se, but they hardly have the allure of Fetches or Shocks. I’m sure there are people out there that would love to see River of Tears return, but I question whether it’s enough demand that they would announce the land cycle is one players have been hoping for. Keep in mind too that only one card is future-shifted, so it wouldn’t be the whole Future Sight cycle – no Horizon Canopy next to Grove of the Burnwillows. I’ve been pondering what lands it is they are giving us since the announcement. Players definitely want Onslaught Fetches so that is certainly a possibility, but I will be genuinely surprised if they go that route. Beyond that, what else have players been asking for? Definitely different blends of tri-color lands, but those would hardly be in character for a set that isn’t focused on multicolor. In fact, the answer sprang to me as I was working through this paragraph – enemy manlands. It’s definitely something people have been wanting for quite some time, and it doesn’t clash with any expectations about Theros. Furthermore, Encroaching Wastes and Burning Earth could both be safety valves in M14 to prevent manlands from getting out of control. As of writing this, I’m quite confident we’ll be seeing enemy manlands appear in Theros. There is a new card type that has something to do with Gods, and it looks like they’re still creatures. I admit that I have little insight into how this could matter from a financial perspective at this point. The only thing that really comes to mind is that the introduction of a new supertype, e.g. Tribal, only increases Tarmogoyf’s stock. Although given that Gods are unlikely to be low casting cost, I would anticipate this interaction to come up rarely at best. Hydras are central to Greek mythology, which is the central theme of Theros. I have no doubt we’ll see more good hydras before the block is finished. Kalonian Hydra exists, and is very clearly the most pushed hydra we’ve seen so far, with Savageborn Hydra also a higher power level than we’re used to on these types of creatures. M14 contains a greater quantity of hydras than we are used to seeing. If you asked someone to guess what color(s) hydras make the most sense in for Magic without prior knowledge of any other Hydra, Green and Blue would probably be their most likely guesses. Speaking of those colors, Evolve is a Blue & Green mechanic that cares a lot about +1/+1 counters. You know what else cares a lot about +1/+1 counters? Hydras. That is a lot of evidence. As savvy investors, it’s vitally important to recognize early signs to capitalize on potential growth. With all this in mind, two cards seem very capable of being breakouts: Renegade Krasis and Vorel of the Hull Clade. Renegade Krasis is fantastic with a card like Kalonian Hydra, and hydras in general. 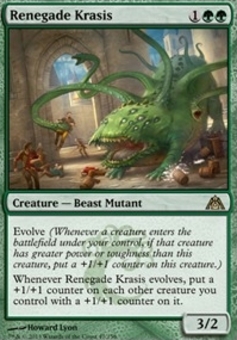 With Renegade Krasis in play, casting Kalonian Hydra would evolve the Krasis, which will then put another counter on the Hydra, as well as any other Hydras or Evolve creatures you currently control. That is a lot of sweet, sweet value. Hydras can also often come into play with variable amounts of +1/+1 counters depending on how much mana was spent to cast them, which means you can use them to evolve your team at different points on the curve. Vorel of the Hull Clade is similar in his application. Not only does he really like bodies evolving so that he can double their counters, he is really into hydras, which are just bonkers with his ability. Imagine untapping with both Kalonian Hydra and Vorel in play. The hydra swings as at least a 4/4, doubling to become an 8/8. Vorel can then double him up to 16/16 on the hydra’s first rumble into the red zone. Both Renegade Krasis and Vorel of the Hull Clade are under $1 at the moment. They are exceptionally easy to pick up in trades, and both could easily jump past $10 if things shake out in their favor. Whew! That is a lot to digest from a single weekend. If we’ve learned anything over the last several days, it’s that you may be able to have your entire cross-country travel expense to SDCC next year covered courtesy of Wizards and whatever promo they have at their booth. I think this is why Travis says “The land cycle is one players have been asking for” in his point-by-point analysis. That is correct. We knew from Sam’s comment (and could realistically infer from what we know about Magic in general) that there would be a cycle of dual lands in Theros. The question is what TYPE of dual lands. Manlands fit the bill quite well in this case. Tribal is a type, not a supertype, which is why it boosts Goyf. Snow, Basic, and Legendary are supertypes, and as such do not boost Goyf. for what it’s worth, the sdcc exclusive did sell on hasbro site today. (wed 24th) for about 30 seconds. you can see it as “sold out” online now. I feel like this clearly makes the most sense with all the enchantment support cards like blightcaster and Ajani’s Pride. No thoughts for enemy scars aka fastlands? I think that much more likely than more man lands, especially given the several recent references from Maro on their change of heart regarding balance between allied and enemy colour pairs. I did consider the enemy fastlands. However, I find them less likely for a few reasons. For one, we just saw the allied fastlands leave standard only a year ago. I highly doubt they’ll bring them back again that fast. Second, the lands in Theros were described as something players have been asking after for awhile. I don’t know anyone really excited about enemy fastlands, although I know that enemy manlands has been in demand since Worldwake released. I’m not entirely sure what comment Rosewater made regarding their change of heart about enemy vs ally lands, but whatever it was, I’m assuming enemy manlands would fulfill that demand the same as enemy fastlands. We know that the cycle of lands in Theros block will be worse for three color decks than the lands we have in standard now and will likely be a cycle of 10 dual lands as people want enemy and ally dual lands in the same block. My guess is it’s a cycle of nimbus maze type lands. Enemy manlands would be interesting , but would wizards just reprint the same ally manlands or make new ones that better fit the greek theme? Nimbus Maze lands are certainly possible. I see the biggest obstacle to this cycle as the fact that it’s not what I would consider an “in demand” land cycle, which was mentioned at the SDCC panel. They are also very powerful with the shocklands. Wizards would very likely print the same ally manlands we have now. You’ll notice many “good” land cycles do not have their names tied thematically to the block they’re printed in. This is to ensure printing in future sets is possible from a flavor perspective.